Washington Post: Do voter identification laws suppress minority voting? Yes. We did the research. New research published in the Washington Post confirms one of the worst-kept secrets in politics: Voter ID laws suppress minority voting. “When we compare overall turnout in states with strict ID laws to turnout in states without these laws, we find no significant difference. That pattern matches with most existing studies. But when we dig deeper and look specifically at racial and ethnic minority turnout, we see a significant drop in minority participation when and where these laws are implemented. 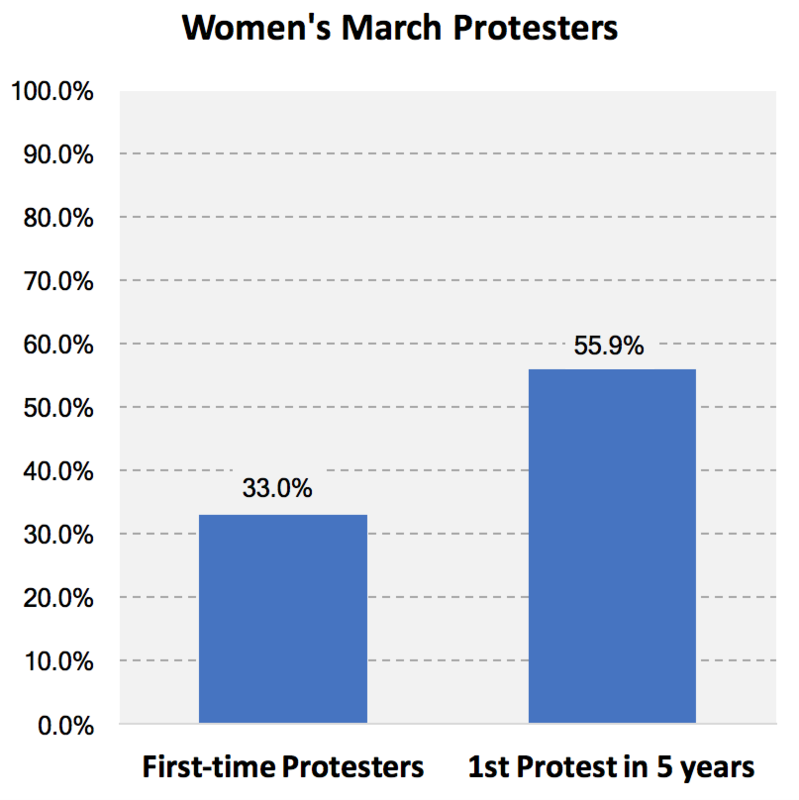 Data on the Women's March: This is what Democracy Looks Like! Read the full report at TSP HQ. 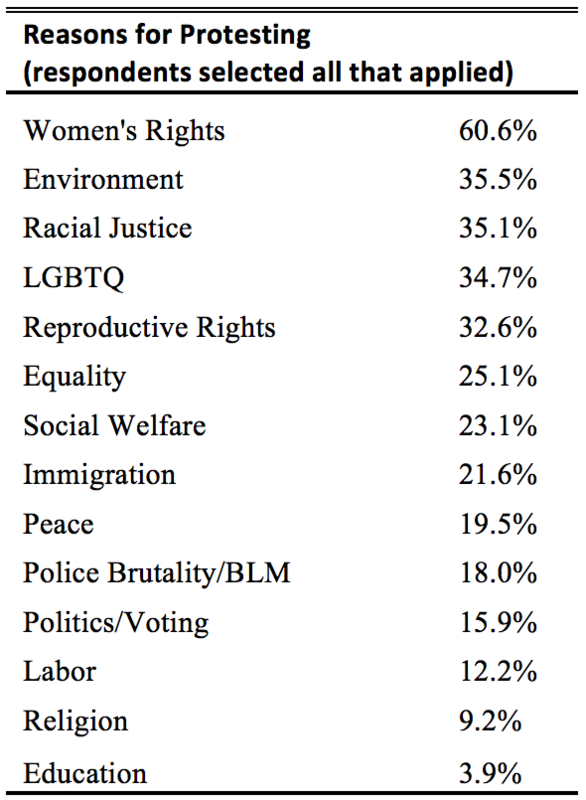 Our sister organization, Women’s Voices Women Vote Action Fund, and Democracy Corps surveyed 1,300 voters between Nov. 7 and Nov. 9, 2016, including an oversample of 200 Rising American Electorate voters and 200 battleground state voters (AZ, FL, OH, IA, NC, NV, NH, PA, VA, WI). Select highlights are below; you can read the full survey here. Using indicators for ballot access and ease of voting like voter turnout, registration rate, registration or absentee ballot problems, and voting wait time, they’ve assigned each state a percentage score for its election administration for every federal election from 2008 to 2014. In the 2014 election, the state with the best score was was North Dakota, with 84%; the bottom-scoring state was Alabama, with 49%. In their interactive data feature, you can view each state’s scores on all of the individual indicators, a ranked list of all the states, or compare states’ scores from election to election. It’s a great tool to see how voters in many states still face significant challenges in order to raise their voice in our democracy. How does your state stack up in Pew’s rankings? Find out here. The Pew Trusts’ Election Initiatives Project tracks a number of data points that provide insight into each state’s voting landscape: among these are turnout, voter registration, and the availability of online registration. One of the most telling indicators of a state’s success in managing elections is Voting Wait Time. Although long waits can indicate excitement surrounding an election, significant variation in polling place lines across precincts and communities may mean that inefficient administration is making voting more difficult for some voters. Average wait time is one measure of the ease of voting: The less time a voter waits to cast a ballot, the more convenient the experience. How does your state measure up? Find out at PewTrusts.org. Indiana’s standalone primary on May 3 has emerged as a must-win for Republican Ted Cruz. Both Donald Trump and Hillary Clinton come into the state with momentum from their multi-state wins last Tuesday. There are 57 delegates at stake in Indiana’s GOP primary, and 92 in the Democratic primary. The Rising American Electorate (RAE)—the unmarried women, people of color, and millennials who make up 57% of eligible voters nationally—make up only 46% of Indiana’s voting-eligible population. Unmarried women make up the largest percentage of the RAE in Indiana. Learn more about their lives.